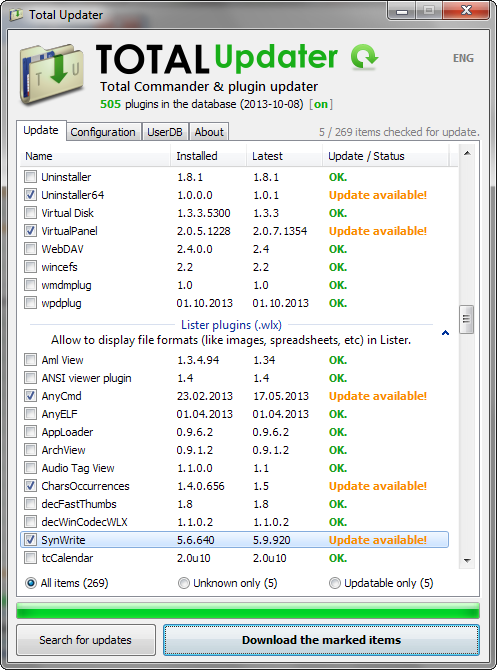 Total Commander & plugin updater. Total Updater is a small tool that helps you to keep your Total Commander & its plugins up-to-date. Do you feel you could translate this utility to your (native) language? It's actually pretty easy - just download this language file, unzip & open it with Notepad (or any other lightweight text editor), then post the finished work on the official forum / mail me, and your language file will be available in the next public version. Click here for the image (you simply need to find a plugin's webID on totalcmd.net using Search). Please report all the bugs and "Unknown." entries in your list (Ctrl + Shift + C to copy their data to clipboard). Suggestions and feature requests are also very welcomed.